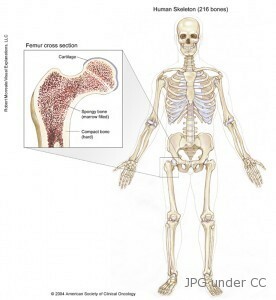 Bone cancer is the growth and abnormal development of bone cells in the bone of the human body. Normally, primary bone cancer or cancer that originates primarily from the bone is very rare and this is a common type of cancer among children than in adults. Bone cancer among adults is usually due to the result of the spreading of another type of tumor in the body. Just like most types of cancer, the person is diagnosed with bone cancer when there is presence of a tumor or a mass of accumulated immature bone cells, which will not only overwhelm the tissues around it but will also clog the oxygen and nutrients needed for proper functioning. There are many types and forms of Bone cancer and this section will discuss some of the most common of bone tumors ever identified. Osteosarcoma – this is the most common type of primary bone cancer and it usually affects males at ages 10 to 25 years old. This type of bone cancer normally is found in the long bones of the arms and legs and rapidly grows around the knees and shoulders of children. People who are diagnosed with osteosarcoma are immediately advised to undergo treatment as this type is aggressive in nature and can easily spread to the lungs. Ewing’s sarcoma – this is the most aggressive type of bone tumor in nature. It can affect young children from ages 4 to 15 years and is usually more common in males, but some believe it be very rare for men over 30 years old. The tumor usually occurs in the middle of the long bones of the arms and legs and has a 65% three-year survival rate. Chondrosarcoma – this is the second most common type of bone cancer and it has contributed to 25% of all detrimental bone tumors among patients. This type of cancer usually occurs in the cartilage cells and has the tendency to either become aggressive or gradual in growth. Chondrosarcoma, as compared to the other two bone tumors, is most common among men at the ages of 40 and above. It commonly affects the pelvic area, hips, and can spread to the lungs and lymph nodes. Most doctors and researchers are still unable to identify the main cause or causes of bone cancer, but suggest that the presence of other ailments and disorders could be a contribution to the development of bone tumors. For instance, a man who has prostate cancer may develop bone abnormalities that could lead to bone cancer. Adults who also have Paget’s disease could also be at risk of developing osteosarcoma. Sometimes, bone cancer is associated with overexposure to radiation. Heavy dosages of radiation can increase the risk of developing bone cancer, especially if you have undergone radiation therapy for other cancers at an early age. Surgery is the most common, which involves removing the cancer or bone tumor along with the surrounding portions of the bone. At first, amputation of the infected arm or leg was the only treatment for such a cancer, but with today’s technological advances, alternatives such as chemotherapy and radiation therapy have taken the place of surgery. For osteosarcoma cases, the surgery would involve removing the bone and replacing it with an artificial device or bone transplant. Radiation therapy, also known as radiotherapy, involves killing the cancer cells using beams of radiation such as gamma rays. Although this is known to be one of the most effective ways on killing cancer cells, it can also cause side effects. Chemotherapy is also suggested, which involves taking in powerful drugs in order to kill the cancer cells.